"We've got the one-day team that goes out and plays that way, but sometimes I feel the message between one-day cricket and Test cricket gets muddled a little." 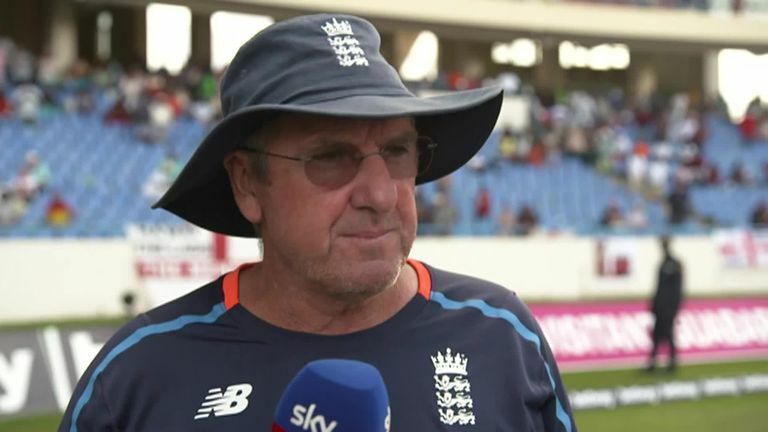 Trevor Bayliss says England's batting struggles may stem from a lack of competition within the county game and a "muddled" mindset between Test and white-ball cricket. England slumped to a series defeat against Windies following their 10-wicket loss in Antigua, in which they failed to pass 200 in either innings. Bayliss' side were skittled for 77 in the opening Test in Barbados and now head to St Lucia for the third Test, looking to prevent a whitewash. "Without a lot of pressure coming up from behind, those guys are our best players, so we've got to try and fit them into the team," said the England head coach, who will leave his role in September. "We have a lot of guys averaging in the low 30s. In years gone by, that wouldn't have been good enough to stay in the team. "It would be great if somebody was pushing them from behind and giving them a little extra motivation to score runs. We'd like to see plenty of guys in county cricket putting pressure on those blokes. One of the difficult things is we've got six guys that are probably suited to batting six or seven and we're trying to fit them into the team. "But the guys we have tried at the top of the order over the last few years have been the best players in county cricket. "There doesn't seem to be the ready-made international player who's made plenty of runs and has the game that can succeed at international level." England have flourished in white-ball cricket under Bayliss' tenure, rising to No 1 in the ODI rankings and winning nine bilateral 50-over series on the bounce while playing with an adventurous approach. But the Australian feels his players may not have grasped what he is looking for in the Test arena. Trevor Bayliss says England's batting was not good enough as they tumbled to a series defeat in the West Indies. "It could have been misinterpreted on the inside," he added. "We've got the one-day team that goes out and plays that way, but sometimes I feel the message between one-day cricket and Test cricket gets muddled a little. "Test team versus one-day team, there's a bit of a different mindset and different rates of success." On what he said to the team after their three-day defeat in Antigua, Bayliss added: "We posed some questions to them in the changing room, giving them 24 hours to have a think about it, and then have an informal chat. "It won't be me standing up in front of them like a schoolteacher. There are some deep conversations going on."